Hairy cell leukemia (HCL) is an uncommon but distinct form of chronic B-cell lymphoproliferative disorder. It affects primarily elderly men, and is characterized by a triad of splenomegaly, pancytopenia, and monocytopenia. The characteristic cells are mononuclear [Figure 1] having abundant cytoplasm exhibiting thin projections that extend circumferentially over the cell surface, with round or oval nuclei, infiltrating the bone marrow diffusely and involving the red pulp of the spleen. 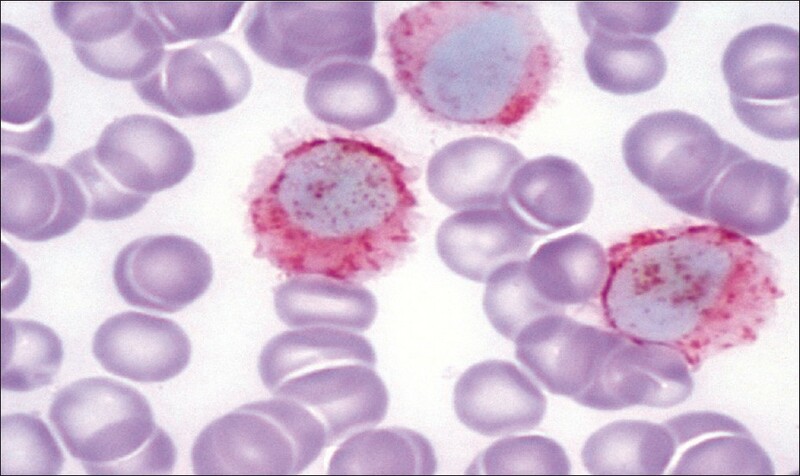 Only a small number of leukemic cells are seen in the peripheral blood (PB) in a classical case. Apart from morphology, HCL has a characteristic immunophenotypic profile and light scatter characteristics. The tumor cells express B cell-associated markers, i.e. CD19, CD20, CD22, and CD79b. Coexpression of CD103, CD11c, and CD25 is considered unique for HCL and is often used as an absolute criterion for establishing the diagnosis of HCL. However, atypical immunophenotypes have been reported in an otherwise morphologically classical HCL. In the present study, we evaluated clinicopathological features including immunphenotypic analysis of cases referred as HCL. There are only a few studies published in literature which provide clinicopathological correlation along with immunophenotypic studies by flow cytometry in HCL cases. This is a retrospective study of nine years duration (January 1, 2002 through December 31, 2010). HCL cases were suspected on morphology and diagnosis was confirmed by coexpression of CD11c, CD25, and CD103. A total of 32 cases of HCL and 10 cases of HCL-variant were retrieved. All the cases of HCL variant (n=10) and four cases of HCL were excluded from the present study, wherein diagnostic workup was inadequate. Hence, final analysis was done on 28 cases. Detailed clinical features were missing in three cases. In the remaining 25 cases, relevant clinical information including presenting complaints, laboratory data at diagnosis, treatment details, and response to treatment was obtained from the patient chart and electronic medical record. Of the total 28 cases of HCL, seven patients were referred to our institute only for diagnosis and hence treatment details could not be traced. Of the 28 cases, bone marrow aspirate (BMA) was available in 25 cases, while PB smear was available in all cases for morphological examination. Cytochemical tests for acid phosphatase and tartrate-resistant acid phosphatase (TRAP) could be performed on eight cases only. Bone marrow biopsy was performed in 24 out of 28 cases and was consistent with involvement by HCL; however, it was not reviewed in the present study. 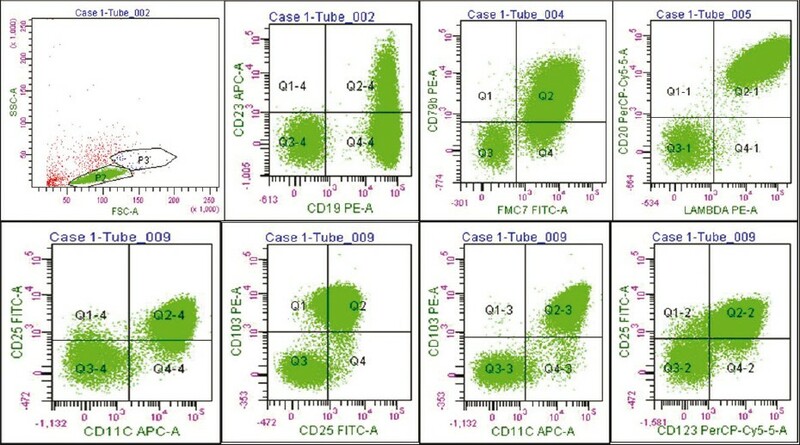 We analyzed Flow Cytometry (FCM) data of these cases. Either BMA/PB sent in ethylene diamine tetra acetic acid (EDTA) tube was processed for Immunophenotyping (IPT) by FCM. The cells were prepared by lyse and wash technique and stained with various combinations of antibodies tagged with various fluorochromes. Three (23 cases) and/or six color (five cases) FCM was performed by collecting 10,000 to 30,000 ungated list mode events. Cells were stained with various combinations of fluorochrome like fluorescein isothiocyanate (FITC), phycoerythrin (PE), peridinin chlorophyll protein (PerCP), PerCP-Cy5.5, phycoerythrin-cyanine 5 (PECY5), allophycocyanin (APC), and APC-H7 labeled monoclonal antibodies (BD Pharmingen). The monoclonal antibodies used were CD19, CD5, CD23, CD45, CD3, CD38, CD22, CD10, FMC7, CD79a, CD20, kappa and lambda light chain, CD3, CD4, CD8, CD11c, CD25, CD103, CD123, and HLA-DR. Cells were incubated in dark for 30 minutes at room temperature and washed with phosphate buffered saline. The data was analyzed using cell quest pro and FACS diva software. Cells were appropriately gated on the forward and side scatter plot in both the lymphocytic (in 12/28 cases) and the monocytic region (in 16/28 cases).The percentage of hairy cells constituted 18-71% in the lymphoid region, while it was 6-55% in monocytic region. The patient age ranged from 26 to 67 years with median age at presentation being 47 years. Majority of the patients were males (24/28); male to female ratio was 6:1. The duration of symptoms ranged from 12days to three years (median=6 months). Detailed clinical information was available in 25 out of 28 cases. The commonest presenting symptom [Table 1] was weakness in 20 cases (80%) followed by fever in 14 (56%) and bleeding in 5 (20%) patients. Physical examination [Table 2] revealed splenomegaly (2-18 cm below costal margin) in most patients: 23/25cases (92%) and hepatomegaly (2-5 cm below costal margin) in a minority: 7/25cases (28%). Two patients had no palpable splenomegaly. In addition, six patients (24%) had lymphadenopathy (palpable-5, abdominal-2); however, none of the patients underwent lymph node biopsy. On investigation [Table 3], 88% of the patients had anemia (Hb<110 g/L) with hemoglobin values ranging from 49 to 134 g/L. Total leukocyte counts (TLC) ranged from 0.5 to 67.4 × 10 9 /L with 31% of the patients (8/26) being leukopenic (normal range=4.0 to 10.0 x 10 9 /L), while two patients had leukocytosis (TLC- 22.2 and 67.4 x 10 9 /L, respectively). Absolute monocyte counts also seemed to be low in all but 1 of the 26 cases (4%). Platelet counts ranged from 4.2 to 19.6 × 10 9 /L, with 77% (20/26) patients being thrombocytopenic. Pancytopenia was seen in 14/26 (54%) cases. Dry tap was observed in 84% (21/25) of the cases where hairy cells constituted 16-97% of the non-erythroid nucleated cells in the BMA. In the PB samples, as low as 10% hairy cells were identified by FCM. TRAP staining was positive in all the eight cases where it was done [Figure 2]. Results of IPT by FCM along with intensity of antigen expression are summarized in [Table 4]. All the cases expressed a characteristic HCL phenotype [Figure 3]: CD19+, CD20+, CD103+, CD25+, and CD11c+. The intensity of CD20 expression was above normal B-cell levels. 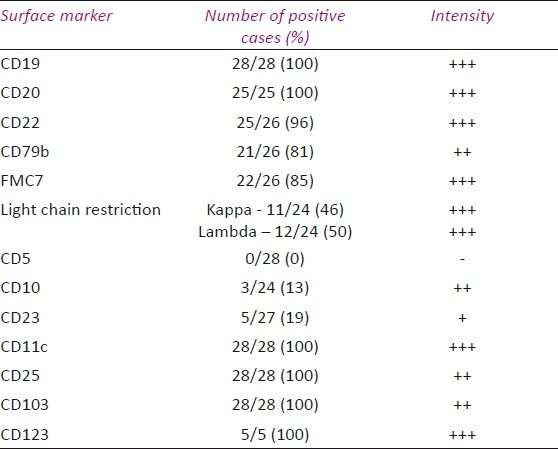 Eleven cases demonstrated kappa light chain restriction, while 12 cases showed lambda chain restricted. Light chain restriction was equivocal in one case. Three cases (13%) expressed CD10, while five cases (19%) demonstrated CD23 expression. Twenty one patients received cladribine based chemotherapy. Nineteen patients (19/21) achieved complete remission after one cycle of cladribine chemotherapy. Two patients required a second cycle of cladribine as they had residual disease which was detected on BMA morphology. One patient experienced relapse five years after initial diagnosis and required further therapy. Detailed follow-up was available in 18/28 cases (64%). Follow-up duration ranged from three to 90 months (median duration - 36 months). All these patients are alive and disease free with absence of symptoms, normal blood counts and no organomegaly. HCL constitutes approximately 5% of all chronic lymphoproliferative disorders (CLPD) presenting at our institute. This figure is much higher as against the incidence of 2% as reported in western literature. In comparison to chronic lymphocytic leukemia, the most common CLPD, wherein the patients are usually asymptomatic and are kept under observation by the treating local physicians, the HCL patients are mostly symptomatic and are referred to a tertiary care center early in the course of the disease for management. This could partly explain a possible referral bias and an increased incidence of HCL in Indian patients. On physical examination, the most common finding was splenomegaly, which was present in 92% of cases. It is interesting to note that one patient who had no splenic enlargement at presentation had relapsed after a five-year disease free interval and showed 16% hairy cells (detected by morphology) in the BMA. Hepatomegaly was seen in 28% cases; less than that reported in other studies. , Though uncommon, lymphadenopathy was seen in six cases, two patients had abdominal nodes detected on CT scan, while one patient had generalized lymphadenopathy, and the others had either axillary or cervical nodes. However, none of the nodes were biopsied. 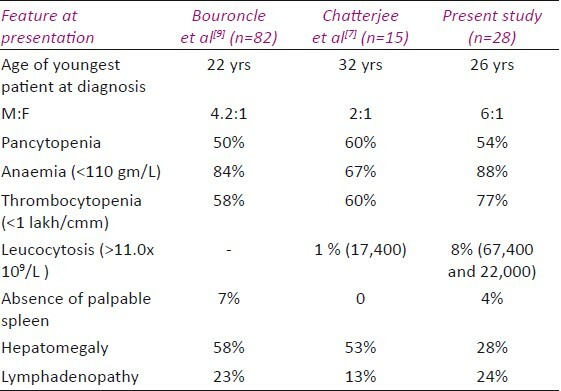 In Burke and colleagues' series of 21 patients, 19 had splenomegaly but only four had hepatomegaly and no patient had significant lymphadenopathy [Table 5]. In Golomb and colleagues' review  of 71 cases, 83% had palpable splenomegaly, hepatomegaly was seen in 19%, and significant lymphadenopathy was seen in 10% (usually localized). Anemia was the most common hematologic abnormality (88%) similar to other studies. Pancytopenia was seen in half the patients (54%) which is in agreement to the result reported by Bhargava et al. Two patients had leukocytosis (WBC-22,400 and 67,400/cmm). Cases of HCL with profound lymphocytosis have been reported only rarely in the literature. These cases illustrate that although patients with classic HCL usually present with pancytopenia, rare cases can present with marked leukocytosis. This possibility should be kept in mind in order to provide accurate diagnosis and proper treatment of this disease. TRAP was positive in all the cases where it was performed whereas Chatterjee et al could pick 93% cases by TRAP test. Accurate diagnosis of HCL is critical because therapy with purine analogues is associated with high complete response rates and long relapse-free survival in patients with HCL but is less effective in patients with other CLPD. HCL is a monoclonal B-cell neoplasm with coexpression of CD103, CD11c, and CD25. It is interesting that CD10, a marker for lymphoid cells with germinal center origin, has been reported positive in HCL in a relatively higher percentage compared with other small B-cell leukemias or lymphomas of non-germinal center origin. In the present study, 13% of the patients analyzed were CD10 positive, while the frequencies of CD10 expression in HCL reported in the various studies have ranged from 5% to 26%. ,, Molecular studies on this subset of cases may give insight to whether these cases represent a subset of HCL with possible germinal center origin. One of the patients had lymphadenopathy, the second patient had residual disease post-cladribrine, and the third patent had leukocytosis with absolute lymphocytosis and expression of CD38 and CD23. CD23 positivity has been reported in approximately 20% of HCL cases in some studies. There have been no reported studies on whether CD23 positive and CD23 negative and HCLs differ morphologically or clinically. Lack of data on CD23 in HCL probably is related to the fact that the status of CD23 does not pose diagnostic difficulties for an otherwise typical HCL, and it is considered an activation marker for B lymphocytes. In the present study, CD23 positivity was seen in 5 of 27 cases (19%) of HCL in a relatively high percentage of leukemic cells (3 cases had more than 75% cells, while 2 cases showed less than 35% cells expressing CD23). One case had unusual manifestations in the form of lymphadenopathy, leukocytosis with absolute lymphocytosis and expression of CD38 and CD10. Two cases had normal platelet counts. However, these cases had morphologic findings typical of HCL, and all had an excellent response to purine analogue therapy. A larger number of cases and more in-depth studies would be needed to address the significance of CD23 and CD10 expression. None of the patients in the present study had a transformation to large cell lymphoma. The value of FCM analysis of peripheral blood in the diagnosis of HCL appears to be under-recognized by many physicians, perhaps relating to a lack of familiarity with the capabilities of this technique and a misperception that leukopenic patients have too few circulating hairy cells for detection. However, as a rapid and non-invasive tool, FCM is ideally suited for the diagnosis and therapeutic monitoring of diseases like HCL, which are characterized by the presence of low numbers of circulating malignant cells. These benefits of FCM raise the issue of whether it can supplant more invasive procedures like bone marrow biopsy or splenectomy in the diagnosis of HCL. In the present study, as low as 6% of abnormal cells (TLC= 2600/cmm) located in the monocytic region on FSC vs SSC gating were detected using FCM. There are a few limitations in our study. We diagnosed cases based on a specific fixed panel of antibodies. Three color FCM was done on 23 cases while six color FCM was performed on 5 cases; the comparison of which has not been done. There was no correlation with the bone marrow biopsy. TRAP was not carried out in majority of the cases. Higher incidence of HCL (5% of all CLPDs) in our setting may be due to a referral bias. HCL can occur at a younger age. Unusual clinical features include absence of palpable spleen, presence of lymphadenopathy and leukocytosis. Though morphologic appearance is classic, Hairy cell leukemia-variant and splenic marginal zone lymphoma can also show similar morphology. Variable expression of CD10 and CD23, which are otherwise used in diagnoses of follicular lymphoma and chronic lymphocytic leukemia respectively, can also be seen. Our findings indicate that it is not uncommon for HCL to display immunophenotypic variation. Recognition of these variations along with morphological and clinical correlation is essential for an accurate diagnosis of HCL. Excellent response to cladribine chemotherapy is noted in majority of the patients. Ours is the only study from India which includes the highest number of patients (n=28) along with their clinico-pathological profile and follow-up. All the patients are asymptomatic. 1. Foucar K, Falini B, Catovsky D, Stein H. Hairy cell leukemia. In: Swerdlow S, Campo E, Harris N, Jaffe E, Pileri S, Stein H, et al, editors. WHO Classification of tumours of Haematopoietic and Lymphoid Tissues. 4 th ed. Lyon, France: IARC; 2008. p. 188-90. 2. Flinn IW, Kopecky KJ, Foucar MK, Head D, Bennett JM, Hutchison R, et al. Long-term follow-up of remission duration, mortality, and second malignancies in hairy cell leukemia patients treated with pentostatin. Blood 2000;96:2981-6. 3. Jehn U, Bartl R, Dietzfelbinger H, Haferlach T, Heinemann V. An update: 12-year follow-up of patients with hairy cell leukemia following treatment with 2-chlorodeoxyadenosine. Leukemia 2004;18:1476-81. 4. Robak T, B³asiñska-Morawiec M, B³oñski J, Hellmann A, Ha³aburda K, Konopka L, et al . 2- chlorodeoxyadenosine (cladribine) in the treatment of hairy cell leukemia and hairy cell leukemia variant: 7-year experience in Poland. Eur J Haematol 1999;62:49-56. 5. Jasionowski TM, Hartung L, Greenwood JH, Perkins SL, Bahler DW. Analysis of CD10+ hairy cell leukemia. Am J Clin Pathol 2003;120:228-35. 6. Gujral S, Polampalli SN, Badrinath Y, Kumar A, Subramanian PG, Nair R , et al. Immunophenotyping of mature B-cell non Hodgkin lymphoma involving bone marrow and peripheral blood: Critical analysis and insights gained at a tertiary care cancer hospital. Leuk Lymphoma 2009;50:1290-300. 7. Malfuson JV, Gisserot O, Cremades S, Doghmi K, Fagot T, Souleau B, et al. Hairy-cell leukemia: 30 cases and a review of the literature. Ann Med Intern 2003;154:435-40. 8. Chatterjee T, Panigrahi I, MahapatraM, Pati HP, Kumar R, Naithani R, et al. Hairy cell leukemia: Clinical, pathological and ultrastructural findings in Asian-Indians. Indian J Cancer 2008;45:41-4. 9. Bouroncle B. Leukemic reticuloendotheliosis (hairy cell leukemia). Blood 1979;53:412-36. 10. Hoffman MA. Clinical presentations and complications of hairy cell leukemia. Hematol Oncol Clin North Am 2006;20:1065-73. 11. Burke JS, Byrne GE, Rappaport H. Hairy cell leukemia (leukemic reticuloendotheliosis).I. A clinical pathologic study of 21 patients. Cancer 1974;33:1399-410. 12. Golomb HM, Catovsky D, Golde DW. Hairy cell leukemia. A clinical review based on 71 cases. Ann Intern Med 1978;89:677-83. 13. Bhargava R, Kar R, Mahapatra M, Saxena R. The clinico-hematological profile of hairy cell leukaemia: A single centre experience. Hematology 2010;15:162-4. 14. 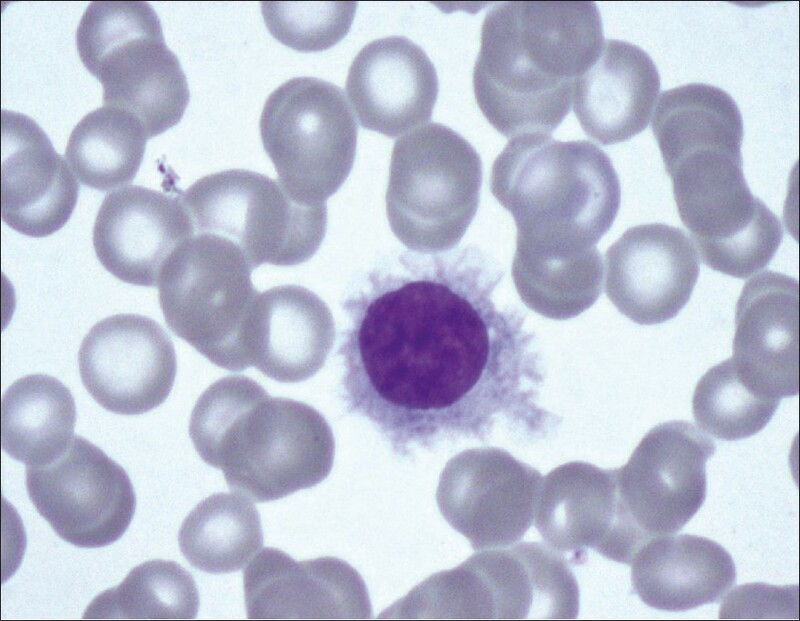 Adley BP, Sun X, Shaw JM, Variakojis D. Hairy Cell Leukemia with Marked lymphocytosis. Arch Pathol Lab Med 2003;127:253-4. 15. Chen YH, Tallman MS, Goolsby C, Peterson L. Immunophenotypic variations in hairy cell leukemia. Am J Clin Pathol 2006;125:251-9. 16. Bacal NS. Flow cytometry: Immunophenotyping in 48 hairy cell leukemia cases and the relevance of fluorescence intensity in CDs expression for diagnosis. Einstein 2007;5:123-8. 17. Cornfield DB, Nelson DM, Rimsza LM, Moller-Patti D, Braylan RC. The diagnosis of hairy cell leukemia can be established by flow cytometric analysis of peripheral blood, even in patients with low levels of circulating malignant cells. Am J Hematol 2001;67:223-6.